MBA Curriculum to include Management Lessons from Vedas, excluding IIMs, as per the latest directions from AICTE. 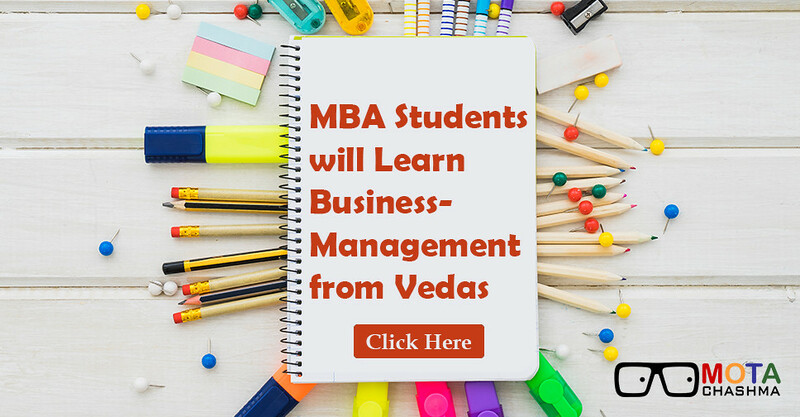 Students of business management courses have to learn about Indian ethics and concepts, according to a revised curriculum for the master’s degree and postgraduate diplomas in business management. In this new curriculum, students will learn Kautilya’s Arthashastra i.e. an ancient Indian treatise based on statecraft, economic policy, and military strategy. This new curriculum is designed by the AICTE and the reason behind that is to impart good values in future CEOs and CMDs. There is a mandatory course titled “Indian ethos and business ethics” has introduced by the panel. This new course will effect from this year will include the “Gurukul” system of learning and karma. Students will also learn management lessons from various ancient treatises such as Vedas, the Mahabharata, the Bible, and the Quran. In Indian Business, several scams could have happened to a lack of moral scruples. “The scandal of Satyam, NSEL crisis, Sahara fiasco, and increasing trend of wilful loan defaulters to banks, huge deposits made by a few business firms/ individuals during demonetization exposes the weak foundations of ethics and values in Indian business scenarios,” it AICTE Panel.